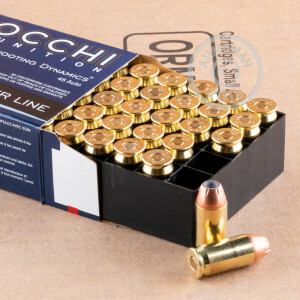 This case of .45 ACP ammunition from Fiocchi delivers strong performance for self-defense and target shooting alike due to its jacketed hollow point bullet. Each cartridge in this case of 500 fires a heavy 230 grain projectile at a muzzle velocity of 850 feet per second. This produces typical .45 Auto ballistics and stout but manageable recoil. 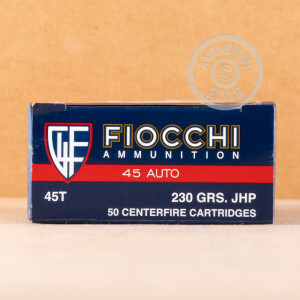 Fiocchi ammunition sold in the US is mostly loaded in Ozark, Missouri with the balance being imported from Lecco, Italy. It uses non-corrosive Boxer primers and brass cases. You can't go wrong buying ammo by the case at AmmoMan.com. We offer free shipping on all orders over $99, and most case orders automatically qualify!